The Native Hawaiians lived in isolation for almost 2000 year(1). They believed in the Kapu system that regulated their everyday life from when and where to eat, daily responsibilities, and when to go to war and when to have peace. They were a self-sufficient and self-governed population with lifestyles and social structures in harmony with their environment (2). In 1778, Captain James Cook and his two ships, Resolution and Discovery, arrived in Hawaii and changed Native Hawaiians and Hawaii forever. With this European discovery, Hawaii was opened to many new enterprises and ideas along with new diseases, hardships and a whole new way of life. Because the Native Hawaiians lived in isolation for so long, their bodies did not need to build up immune defenses to many diseases. The medical Kahuna (priest), were not particularly worried about ma’i kino (body sickness) because it was easily cured with ocean water, herbs or simple praying (1). A bigger problem for the Kahuna was remedying ho’opa’ipa’i, which was a sickness that dealt with family members, past and present (3). With the arrival of Captain Cook, and later the missionaries and other trades folk came the common diseases that were not common to the Native Hawaiians. These diseases included small pox, measles, chicken pox, and sexually transmitted diseases (2). Before Captain Cook arrived the Native Hawaiian population was estimated to be about 800,000, by the late 1800 they numbered less than 40,000 (2). The Native Hawaiians lived an orderly life that was in harmony with their environment, but with western contact their belief system would be changed. The Kapu system regulated every aspect of the Native Hawaiian's life. There were rules for everything including clothes. It was not right to wear clothing of anyone other than kin and a daughter was not allowed to wear clothing of her mother, but her mother could wear her daughter (3). 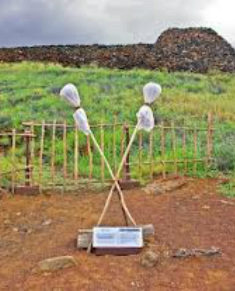 There are many examples of the kapu system, but because of the diseases that the Westerners brought, many Native Hawaiians were dying and naturally they turned to their gods for help. When their prayers were not answered a loss of faith in the kapu system occurred. This allowed for more missionary influence and helped lead to the abolishment of the Kapu system. The Native Hawaiians lived and worked on self-sustaining lands called ahuapua’a. They did not own the land nor did they believe they could. The land was part of their family and they took care of it as the land takes care of them. These ahupua’a went from the mountains to the sea, and inhabitants shared goods and services (2). With the arrival of foreigners, Native Hawaiians had to learn about land ownership, individual wealth and capitalism. Foreigners were increasingly putting pressure on the Mo’i (king) to sell their land. In 1848, King Kamehameha III decided to split the land calling it the Great Mahele. In the end .8% of the land went to 30% of the Native Hawaiians (1). By 1840 missionaries and white business men controlled most of the land and economy (2). The Native Hawaiians found themselves in a predicament where before they would work the land and the land would provide food, now they would have to buy their food. With these new diseases, the abolishment of their religion and the loss of their land and livelihood the life style of the Native Hawaiians changed for the worse. Western influences in most aspects were a detriment to the Native Hawaiians physically, culturally and spiritually. But as time passed, the Native Hawaiians were better able to survive because of help from their Ali’is in the form of charitable trusts. In 1859 Kamehameha the IV and Queen Emma created Queens Hospital and in 1883 the Lunalilo home was established to take care of Native Hawaiian Elderly. 1. Hope, B. E. and Hope, J. H. (2003). Native Hawaiian Health in Hawaii: Historical Highlights. California Journal of Health Promotion, 1, 1-9. 2. Braun DrPH, K. L., Mokuau DSW, N., and Brown DrPH, C. (2011). Life Expectancy, Morbidity, and Health Practices of Native Hawaiian Elders: A Review of Hawaii Surveillance Data. Ha Kupuna National Resource Center for Native Hawaiian Elders, Myron B. Thompson School of Social Work. 3. Handy, E. S. C. and Pukui, M. K. (1998). The Polynesian Family System in Ka-'U, Hawaii. Honolulu, Hi: Mutual Publishing.